Klayman: The Likes of the Communist-Leaning "The Nation" and the Jewish Left Are a Bigger Threat to Jewry and Israel Than Even Ilhan Omar! Attacks on Congresswoman Ilhan Omar are rising. One of the first Muslim women elected, Omar is also black, an African immigrant, a former refugee from Somalia, and wears her hijab in the halls of Congress. She is under attack from the leaders of her own party for anti-Semitic statements she never made, for anti-Jewish prejudice she never expressed, for hatred of Jews she doesn't hold. 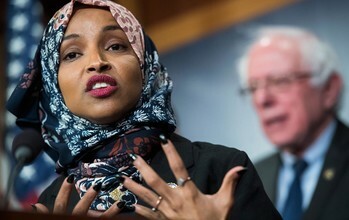 And the Democratic Party leadership is considering a resolution whose early text, at least, while not mentioning Omar by name, is clearly aimed at accusing her of precisely those things, despite the fact—ignored by the Speaker of the House and other top officials—that she never said or believed any of those words. The most recent attacks on Representative Omar are based on her answer to a broad question about anti-Semitism during a recent town hall meeting at Busboys & Poets in Washington, DC. I was there, sitting just a few feet from Omar, asking a question during the Q&A. She never said that Jews have dual loyalty. She never expressed "prejudicial attitudes" or supported "discriminatory acts" against Jews or anyone else.